Well it's not an official school science project, but none the less at has become a project for our entire family to watch and I have to say somewhat enjoy. Do you remember finding tadpoles as a kid. I remember when my parents were still in the process of bulidng our house in North Royalton and my brother Joe and I collecting baby frogs and finding tadpoles everywhere! 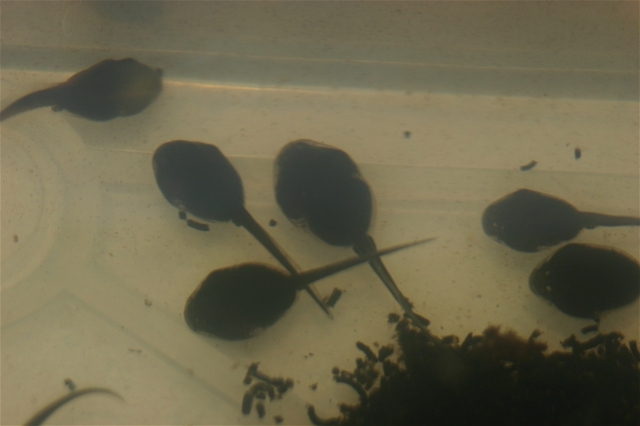 It was fun to see them as they were part tadpole and part frog. Well here we are doing the same thing - except we are keeping them in a container in our house. The original bunch was found by Joel and Zach while working on our rental property in North Royalton. They said it was like a black river there were so many tadpoles. So they scooped up a cup and brought them home. In the last day or so we just started noticing front and back legs. Will have to get my macro lens on and get a new updated picture.